I hate 2 regrets about the 16 months I lived in Tulsa. The first is never making it to Oklahoma City. I have no excuse as to why, it just never happened. The second is never trying okra (other than fried). 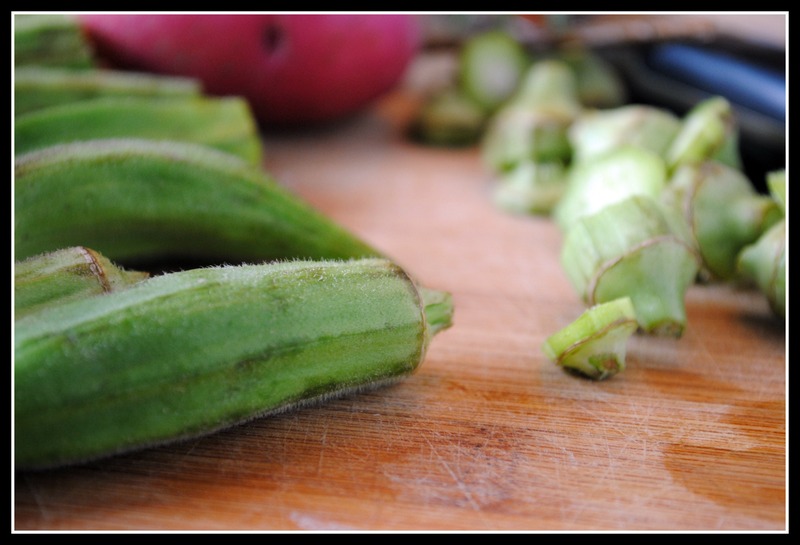 Okra is the quintessential Southern veggie, and being the Northerner that I am…my loss. Until last week, okra was a foreign vegetable to me. And Mr. Prevention. I had heard the texture described as “slimy” and thus, battering and deep fat frying it was how people battled this to create an acceptable vegetable. I put this on the same level as the French fry — once it’s fried, it’s no longer a veggie. And while that’s not “true”, the nutritional value is hampered with and the saturated fat, trans fat, and calorie count defeat what’s most beautiful about vegetables in their whole, natural state. I did learn something about okra through this process, so I’ll give you a heads up: bigger isn’t better. Not knowing anything about okra, I just grabbed a few handfuls of the veggie and piled it into my produce bag. Ends up, the large okra have really, really tough skins. And they’re fiberous like celery ribs in that I’m-not-so-fond-of-this texture (::chew chew chew::) kind of way. 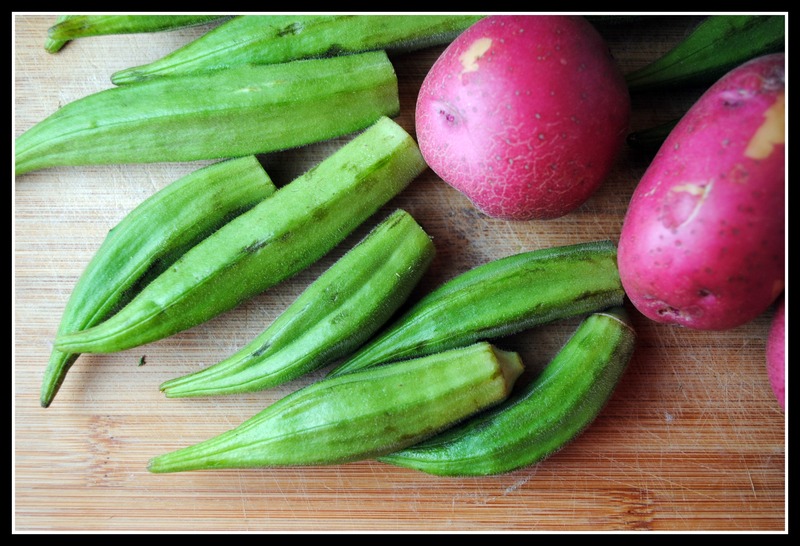 The okra that were smaller (2-3 inches) were tender and not at all “slimy”. 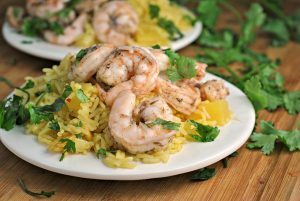 They were fairly neutral-flavored and took on the flavors in which they were cooked — lemon, rosemary, and olive oil in the case of this recipe. Okra success! Put oven rack in middle position and preheat oven to 450 F.
Combine potatoes, 2 sprigs of rosemary (chopped), 2 tablespoons olive oil, 1/2 teaspoon salt, and 1/2 teaspoon pepper. Spread potato mixture in a large roasting pan and roast, stirring once, 20 minutes. Meanwhile, whisk together lemon juice, shallot, remaining rosemary, and remaining 2 tablespoons oil, 1/4 teaspoon salt, and 1/2 teaspoon pepper in a large bowl until combined. Set aside. Meanwhile, cook corn in 1 quart of salted boiling water for 3 minutes. Drain and set aside. 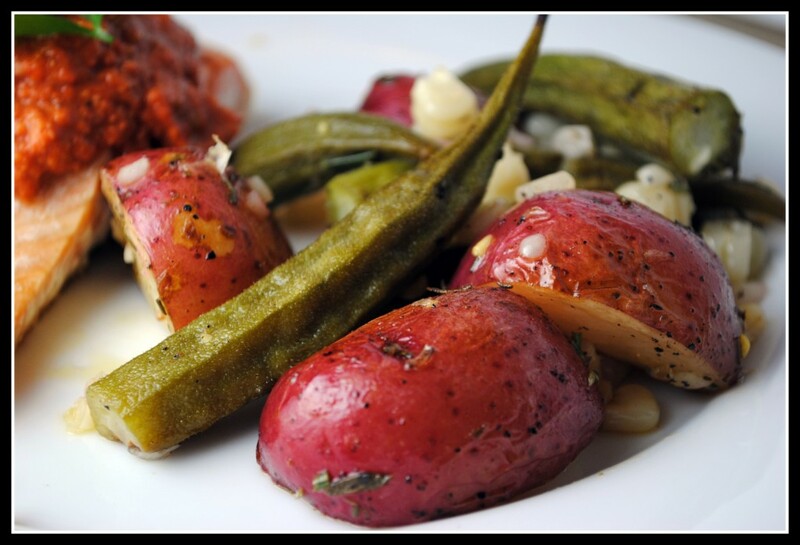 Stir potatoes and add okra to pan, tossing to coat. 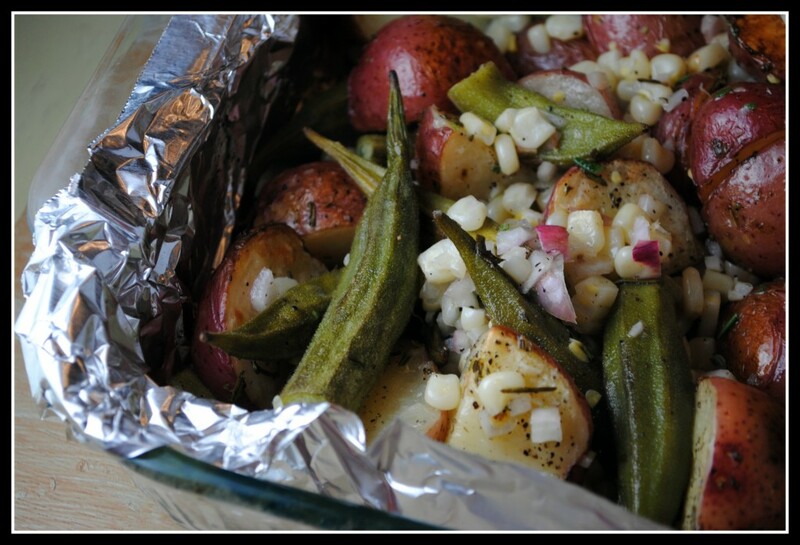 Continue to roast until okra and potatoes are tender, about 30 minutes more. Remove veggies from oven, add corn and dressing, and toss to combine. Serve hot or warm. Yield: 7 servings (about 1 cup each). Result: Seasoned perfectly! 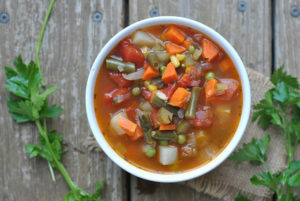 I know some readers were seeking more vegetable sides and I strongly recommend trying this recipe. I think the seasoning/dressing recipe could go on just about any veggie mixture — I think I’ll use it on Brussels sprouts this week. Great flavors and simple to make…enjoy! After a weekend of travel and wedding indulgences, my body is craving workouts and balanced meals. I couldn’t think of a more perfect recipe to post for today, to start off a healthy week. Of course, it will be a short week as I am heading to Chicago next weekend for another wedding! Love is in the air this fall! Question: Have you ever had okra? If so, do you like it? Aw man, I’m jealous right now! I went to make roasted okra from some I had in the fridge, and then found out I left them in there too long. The slime was on the outside, not the inside. It took me a little while to get the hang of okra. I too always thought they were a little slimy, but that works well in some dishes. And roasting them does kind of prevent that! (Frying too, of course). I’m a good southern girl…I Lurrrrrve okra. I’m always surprised by how many people say they don’t like it– without even trying it! It really is delicious! I’ve never had okra, but I’m curious about it! I have only had deep fried okra, and I liked it, but then again I’ll eat just about anything deep fat fried! I have never tried okra. I will have to try this recipe. The one reason I love reading blogs is because it opens up my eyes to many foods I’ve never tried. Hi Nicole. I have never tried okra. I’m going to go on the lookout for some small ones and give it a go soon. Have a wonderful Monday!!!! I’ve never had okra before, or even seen it for sale anywhere. I would have absolutely any idea what to do with it. I’m glad you enjoyed the salad!